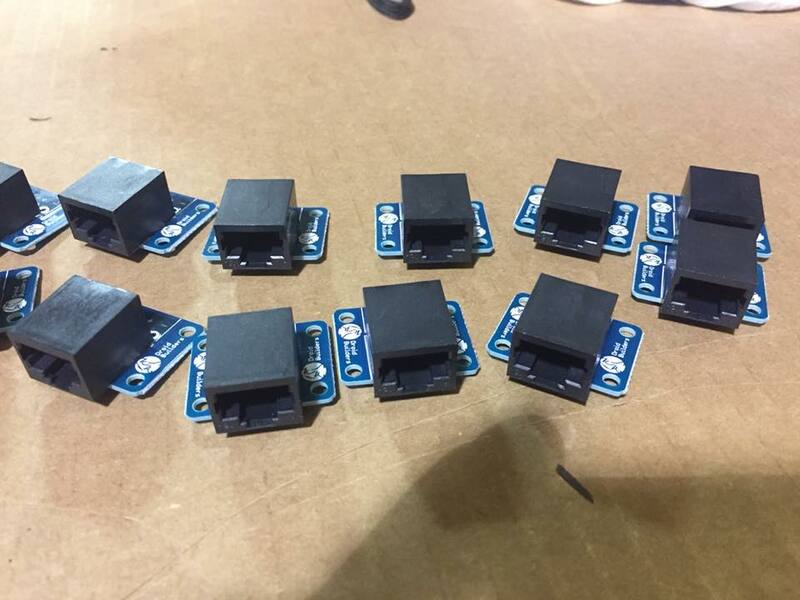 This opportunity is to solder a group of breakout boards to be used for the lighting stanchions as seen at the previous Celebration. A takeaway from last time was that we needed a more foolproof way to connect the stanchions to the power supply and that they would not be easily kicked out. For this endeavor, you will need to solder two components to the breakout boards. There is a network jack and the cable connector (not pictured). I set the skill as moderate since the network jacks have a very small pad footprint. If you’re not comfortable soldering in a small footprint, this might not be the best project to attempt. They don’t really take very long to do, I spent about 3 hours soldering and was able to do 120 of these. I think the longest time I spend was just setting up my workspace so I could go through them fairly quickly. I’ll be sending you a small USPS flat rate box with all the boards, connectors, and jack. You’ll need to supply your own iron and solder. Once done, I’m requesting you send them back so they can be added to the inventory. Please note, though I only have three boxes at this time, there are an additional 300 that will be done at some point in the future. I’ll go through the interest list sending them at as I get the extra parts. (I don’t have ethernet ports at this time). Thank you for your time and helping us out with Star Wars Celebration!